Self-assessments are irresistible. We all love to compare ourselves to others, find out what our strengths are (and our weaknesses, if you force us to look at them). We proudly proclaim our communication styles (“I’m very high D”), our Myers/Briggs types, even our zodiac signs. I’m usually a little skeptical of these assessments, though. With most of them, it’s pretty obvious where the questions are heading, and it’s hard not to skew your answers toward a flattering outcome. But bearing in mind that assessment tests can be ephemeral, I was intrigued by the one that comes with StandOut. I carefully cut open the sealed insert bound into the book and then messily scraped off the foil with a quarter, to get my secret access code to the online test – free with the purchase of the book. After creating an account on Buckingham’s website, I was ready to begin. Mind open, I began to read what the book said about my roles. And it’s an interesting collection: not only the definition of each role, but also suggestions for how to describe myself at a performance appraisal; how to make an immediate impact; how to take my performance to the next level; what to watch out for; and how to win as a leader, a manager, and a salesperson. Although it’s hard to imagine myself saying “I’m one of the most resilient people I know” in an interview, I found a lot of the ideas intriguing. I especially liked the suggestions for how to communicate with those whose strengths differ from mine: allow them time to sift and reflect, provide more details than I might think are necessary, and so on. The book has a few short chapters that describe how the assessment came into being, why innovations work better when they’re keyed to people’s roles, and how to build on your strengths. 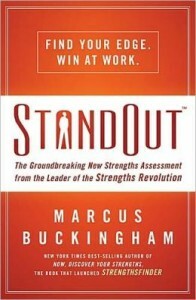 Except for those, all of the material in the book is available on the StandOut website, where you can take the assessment and receive your results for $15. The website also shows you how your top two roles work in combination, ranks all the roles from your assessment, and gives you an action planning form called the Strengths MAP. So if you consider paper and ink “so last century,” you might want to skip buying the book and go directly to your computer. There are useful ideas here, although I wouldn’t agree with the author that StandOut is “The Rosetta Stone for understanding your strengths and those of the people around you.” But then, I’m a Gemini.